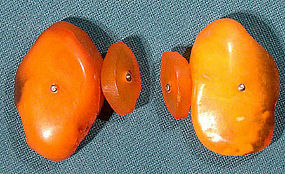 A vintage pair of natural Russian chunk amber cufflinks. These cufflinks measure 1-1/8 x 7/8" and they have chunk amber retaining links joined by metal loops. They are unsigned, and they are in excellent condition with no chips, cracks, dents, bends, corrosion, losses, damage or repairs. All items are thoroughly and conservatively graded and all condition issues are noted; all items are vintage or antique and may have slight signs of gentle use. Surface insured shipping to the U.S. is $6.30 (other spots may vary) - insured is higher, and mandatory on items over $95 if paid with a credit card. Items paid with a credit card will be shipped to confirmed addresses only. We do ship internationally. All of our prices are in $US. NOTE: we DO NOT accept PayPal, only VISA and MASTERCARD. 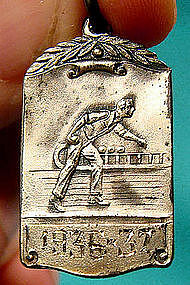 A vintage 1" x 5/8" sterling silver 5 pin bowling award fob or pendant dated 1936-7. Awarded to R. HANNA, this award is stamped STERLING, it weighs 4.4 grams, and it is in excellent original condition with no dents, bends, corrosion, losses, damage or repairs. We haven't polished this fob as it has a satin finish and was easier to photograph unpolished. All items are thoroughly and conservatively graded and all condition issues are noted; all items are vintage or antique and may have slight signs of gentle use. Small packet surface shipping to the U.S. starts at $6.95 (other spots may vary) - insurance is included to $99. Items paid with a credit card will be shipped to confirmed addresses only. We do ship internationally. All of our prices are in $US.PLEASE NOTE: We DO NOT accept PayPal, only VISA and MASTERCARD. A vintage pair of Art Deco carved mother-of-pearl rhodium plated cufflinks from the 1920s. 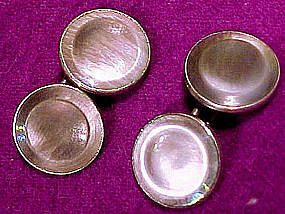 These 9/16" across cufflinks have mother of pearl inserts on each segment, they are stamped PAT. SEPT. 14-20. and they are in excellent original condition with no chips, cracks, dents, bends, corrosion, losses, damage or repairs; there is some dirt which we have since cleaned off. All items are thoroughly and conservatively graded and all condition issues are noted; all items are secondhand and may have slight signs of gentle use. Surface shipping to the continental U.S. starts at $6 (other spots may vary) - insured is higher, and mandatory on items over $85 if paid with a credit card. Items paid with a credit card will be shipped to confirmed addresses only. We do ship internationally. All of our prices are in $US. NOTE: we do not accept PayPal. 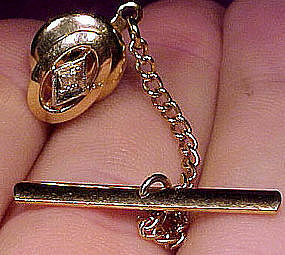 A 10k yellow gold diamond tie tack or tie pin from the 1960s. This 7/16" x 1/4" man's tiepin or tie tack has a 2 point (size by gauge) genuine round brilliant cut diamond. It has a gold plated bulldog clasp and a t-bar and chain guard. It is stamped 10K with a maker's mark (also tested since the mark on the shaft is slightly worn, and diamond has been tested). It weighs 0.6 grams (without bulldog clasp) and it is in excellent vintage condition with no chips, cracks, dents, bends, corrosion, losses, damage or repairs. All items are thoroughly and conservatively graded and all condition issues are noted; all items are vintage or antique and may have slight signs of gentle use. Tracked Packet shipping to anywhere in the U.S. is $14.00 - this includes online tracking, air service and insurance up to $70. Items paid with a credit card will be shipped to confirmed addresses only. We do ship internationally. All of our prices are in $US. PLEASE NOTE: We DO NOT accept PayPal. An attractive pair of 9/16" diameter unsigned chrome plated cufflinks with abalone shell inserts. The inserts have a nice smoky grey colour with red and green flash; they are free-back (loop-link) and they are in excellent original condition with no chips, cracks, dents, bends, losses, damage or repairs other than some minor surface spotting to the chrome on the backs. All items are thoroughly and conservatively graded and all condition issues are noted; all items are secondhand and may have slight signs of gentle use. Surface shipping to the continental U.S. is $6 (other spots may vary) - insured is higher, and mandatory on items over $85 if paid with a credit card. Items paid with a credit card will be shipped to confirmed addresses only. We do ship internationally. All of our prices are in $US. Please note that we do not accept Paypal. 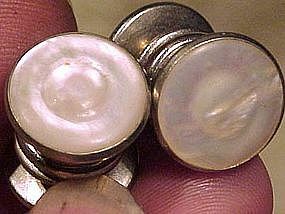 An attractive pair of Snap-Link c1930 cufflinks with matural mother of pearl inserts. These 1/2" chrome-plated cufflinks are in excellent original condition with no chips, cracks, crazing, dents, bends, corrosion, losses, damage or repairs. All items are thoroughly and conservatively graded and all condition issues are noted; all items are secondhand and may have slight signs of gentle use. Surface shipping to the continental U.S. is $6 (other spots may vary) - insured is higher, and mandatory on items over $85 if paid with a credit card. Items paid with a credit card will be shipped to confirmed addresses only. We do ship internationally. All of our prices are in $US. 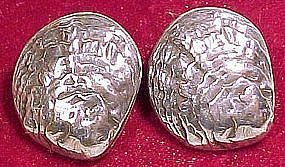 A pair of Victorian shell shaped silver plated collar buttons. This unusual pair dates to the 1880s and they are in the form of clam or scallop shells. These 7/8 x 13/16" buttons are in very good original condition with no dents, monograms, bends, corrosion, losses, damage or repairs other than some minor wear showing brass on the highest points and some minor bending to the circular retainer on one shell. All items are thoroughly and conservatively graded and all condition issues are noted; all items are vintage or antique and may have slight signs of gentle use. Tracked Packet shipping to anywhere in the U.S. is $14.00 - this includes online tracking, air service and insurance up to $70. Items paid with a credit card will be shipped to confirmed addresses only. We do ship internationally. All of our prices are in $US. PLEASE NOTE: We DO NOT accept PayPal. 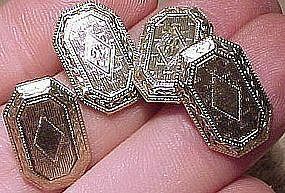 A lovely vintage Art Deco pair of engraved cufflinks in 10k white gold c1920. These 1/2" x 7/16" cufflinks weigh 2.8 grams, they have a JG monogram, and they are in excellent condition with no losses, dents, corrosion, repairs or damage. Tracked packet air shipping is $14.50 (to the US - other spots may vary) - insurance is included. Items paid with a credit card will be shipped to confirmed addresses only. We do ship internationally. All of our prices are in $US. PLEASE NOTE: We DO NOT ACCEPT PayPal, only VISA and MASTERCARD.